‘Where’s My Water?’ Review – Who Knew Alligators Love Bathing? After writing reviews for Feed Me Oil [99¢ / HD / review] and Sprinkle [99c / review] earlier this year, I was keen to check out the latest liquid-based game from Disney Mobile, the people behind Jelly Car 3 [Lite / 99c]. Their popular new game, Where’s my Water? [99c] is based on ‘Swampy the Alligator’, who lives in the sewers and enjoys taking relaxing baths, but unfortunately the other alligators keep sabotaging his water supply, so he needs some help. 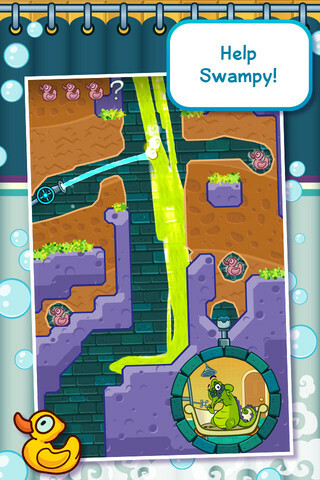 Our job is to guide the water to Swampy’s bath, by swiping tunnels through the dirt, to direct the water’s flow. 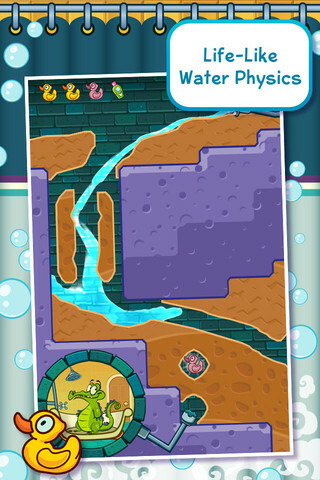 Along the way the water can collect three rubber duckies to unlock subsequent worlds and levels. Your score is based on the time taken to full the bath, number of rubber ducks collected and a bonus for water overflow. Where’s my Water? is similar to Feed me Oil, as you need to ensure enough drops of water reach the destination (bathtub), but instead of positioning devices on the screen to divert the flow, you’re digging out water-channels with your finger. The liquid physics are not quite as impressive as Sprinkle or Feed Me Oil, with the water looking pretty lumpy at times, especially at the surface or when the water separates, however it looks reasonably good and does flow where you’d expect. There are 80 levels, split across four worlds, with new gameplay mechanisms regularly introduced. The first forty levels are pretty straightforward, with the solution being immediately obvious. It’s easy to score three ducks (“tri-duck") on the first two worlds without much thought. Fortunately, some harder levels pop up in the third and fourth worlds. If you make a mistake, or miss one of the three ducks, there’s a handy restart button to quickly reset the level. By collecting sets of hidden objects scattered around the levels – such as a lucky loofah and a toothbrush – you can unlock an additional 8 bonus levels. These feature different types of game-play, including some tilting to move the water. Of course, there’s various obstacles to overcome, such as noxious green algae which grows if it comes into contact with your water-stream, pools of acid which absorb your water and water-activated switches which cause other blocks to move. You’ll also encounter yellow toxic ooze, which eats through the dirt and destroys Swampy’s precious rubber ducks, forcing you to act quickly. There are pipes which accept water (or acid) and squirt it out the other side, mines which explode and water/acid hoses to activate, so there’s plenty to keep you entertained. Sometimes you need to draw two tunnels at once, which involves swiping simultaneously with two fingers to split the flow. But be careful, or your precious water might drain away, off the side of the screen. H2O isn’t the only liquid you move around. You also swipe tunnels to shift or drain the acid. The powerful corrosive attributes of the acid are useful for destroying any algae which blocks your way. Although this game is really enjoyable, the screen navigation is not perfect. Some levels are slightly larger than one screen, so a scroll-bar is provided for panning up and down, which seems a little old fashioned. The scroll bar is awkwardly positioned on the left side of the screen, forcing right-handers to reach across the screen to scroll, unless you use your thumbs, which is an odd design decision. Luckily you don’t need to scroll too much. 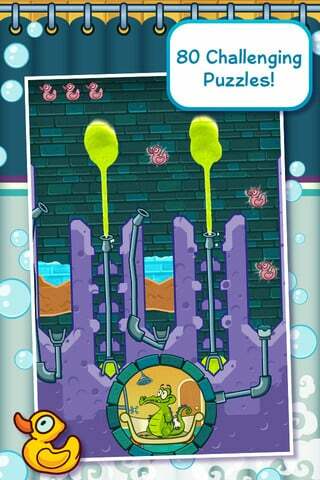 Regardless, I’ve had a ton of fun playing through Where’s My Water, and I really hope Disney keeps the updates flowing.